So I rewound the programme (aren’t these new satellite receivers marvelous) and sure enough there I was! Certainly a pic for my scrapbook. Later still, ‘Monkey, check the life support systems for the man’. “Nasa replies, ‘In 15 minutes – feed the monkey’. The exodus of Southern Kings players continues. There can be but a handful of our Super Rugby squad announced in January still plying their trade here in the Eastern Province. The latest? Cornell du Preez. “Watson (Kings president) confirmed yesterday that Cornell du Preez had also been released from his contract with immediate effect, to sign with Edinburgh Rugby in Scotland. 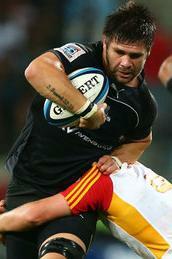 Watson said he was excited that Du Preez had been given the opportunity to further his rugby career. There are 6 major playing regions here in South Africa but only 5 places available in the Super Rugby competition (in it’s current format.) I’ve explained previously that for as long as there has been Super Rugby my little part of the world has been completely ignored, that was until this year. Be it politics, compassion or just plain old common sense our rugby hierarchy decided to to give us a chance and entered Eastern Province (under The Southern Kings franchise) in this years competition, at the expense of last year’s lowest ranked S.A. team ( The Lions) with the proviso that the Kings play the Lions in a home and away relegation / promotion series of matches come the end of the season. Well, the first of these relegation / promotion matches was played last night, right here at our magnificent new FIFA world cup stadium, and yes, you’ve guessed it, the Kings lost. After a much needed weekend off last week we were back at the stadium supporting our mighty Kings. This weekend it was the turn off the Bloemfontein based Cheetahs to visit the shores of our bay. The Cheetahs are a strong outfit, with four or five Springboks on the team but their real strength lies in their squad. They assembled a team of young players perhaps five years ago, these guys have played together, toured together, know each other well with the result that they are a really good team, no superstars but a good team. They’re also presently fourth on the super rugby log, no mean feat that, there’s some tough opposition out there but after a stunning tour of Australia and New Zealand (3 wins in 4 matches) they’ve maintained the momentum and are having a good, no a great season. After last week’s humiliation at the hands of those Aussie Warratahs my Kings hosted the Highlanders this weekend, a team packed with All Blacks and boosted with the confidence of a victory just last week against the Sharks, but more about that later. Remember my “Super season tickets” post back in February? The one where I explained that a local bar had 2 ‘royalty package’ season tickets to hand out as prizes for all home game? Guess who won them this week? Ha ha I can hear you all laughing, of course it was me! Now as you know, I go to the games anyway, we always have great seats but these? These are special, plus the facilities which were still being constructed during my first visit (bar, restaurant, lounge, flat screen tv’s, big screen etc.) are now all in place. It really is a magnificent (royal (?)) way to watch rugby, or any sport for that matter. So how did my Kings do this week? Most here aren’t going to believe me but I assure you that I’m telling the truth we WON! Have I mentioned how much I’m enjoying this year’s Super Rugby season? Hopes were high, well mine were, for all of 30 seconds that is, for that is just how long it took for this Aussie outfit to score their first try! It wasn’t all doom and gloom, our new darling of E.P.rugby Sergeal Petersen got us out of our seats with a brilliant try just before half time, but I’m afraid that was all my Kings had to offer. Author SoutiePosted on March 13, 2013 April 21, 2013 Categories GeneralTags E.P., Eastern Province Kings, Port Elizabeth, Southern Kings, Super Rugby, Super XV25 Comments on A jumbo caption perhaps? After a glorious victory against the Aussie Force two weeks ago (and a bye last week) our Super Kings hosted the first of the heavyweights last night. The Sharks were last year’s losing finalists, they are a side packed with current Springboks (we have not one) and we kept them tryless! Our magnificent Nelson Mandela Bay stadium was a sell out, that’s 42,000 people packed in to savour a super rugby derby. Sure it’s been full once or twice before but that was during the FIFA world cup, no passion, no partisanship just an extravaganza (albeit a jolly good one) and of course our two rugby tests against England and the All Blacks, this was different, completely different! If our first victory in the competition hasn’t made the opposition sit up and reconsider our ‘whipping boy’ tag then last night must have, our Kings were simply magnificent. One report tells us “only 1 tackle missed out of 107” They defended like lions (not the Transvaal kind but the four legged ones with manes!) and on attack? Opportunities though few and far between were taken, so much so that with only 2 minutes to go we were in a bonus point winning position but fate dealt a cruel blow, we were robbed of that bonus point in the last minute of the game.